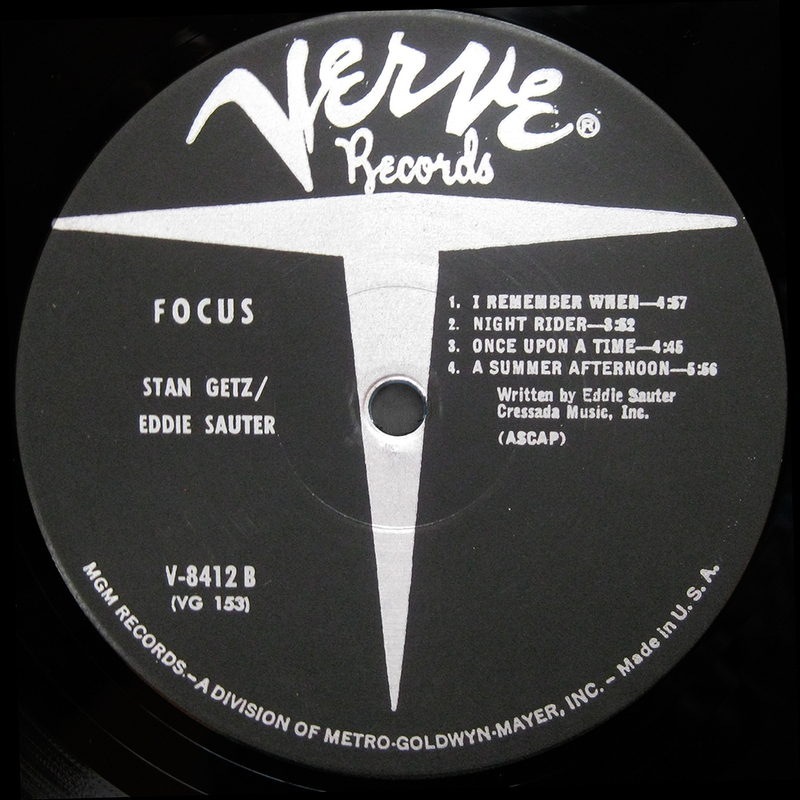 Verve Records founded by Norman Granz in 1956, absorbing the catalogues of his earlier labels, Clef Records (founded in 1946) and Norgran Records (founded in 1953), and material which had been licensed to Mercury previously. Reflecting its serial corporate merger and aquisition history, VMG today is owner of a huge historic catalogue of recordings, most of which it has absolutely no idea what to do with and for which there exists precious little commercial market. A beautiful original first pressing with very fine sound, that was fiercely fought over on eBay. And won without paying to much over the odds. Seeing that this is an active thread, I’ll re-post my earlier question —- I have three question regarding what is commonly referred to as the Norman Granz’ Jam Session series. FIRST QUESTION: Regarding the original 12″-LP edition, can you confirm that the release order went (i) Mercury; (ii) Cleff; (iii) Verve trumpet; and (iv) Verve – T. SECOND QUESTION, did all of the series come out in a 7″ edition? THIRD QUESTION: I’ve heard rumor that there was a 10″ of the Jam Sessions, like the JATP but I’ve never seen a listing for one. Gentlemen – I am out of my depth here, drowning not waving, over to you. But unfortunately cannot help with the other questions. It would be great if you’d be more specific. As I know, there were at least 9 records that were issued in the Norman Granz Jam Sessions series over the years..
2. I guess the first 5 Jam Sessions were printed in 7″ format, 6th went to MGC 656 instead of MGC 4006 and wasn’t issued in 7″. Later jam sessions weren’t issued in 7″ as well. 3. Didn’t get that one.. I encountered an Ella and Louis MG V-4003 with an orange label and black T and cannot find any information regarding that different label. 2 other websites showed pics of the orange/black label yet no description nor info on it. Can you comment on this?? Label 2B in the page above? 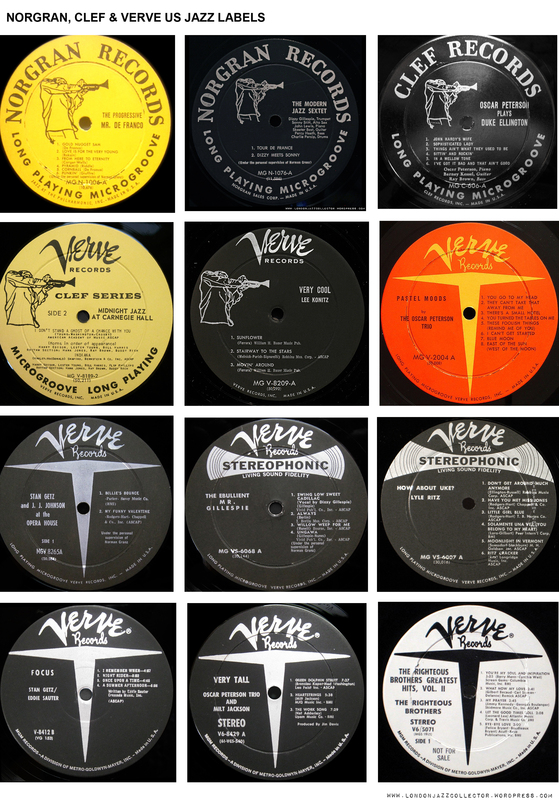 As we can see labels did change that way – at first there were color labels, then black (for example, Norgan yellow at first, then Norgran black, Verve trumpeter yellow label at the first part of 8000 series, then Verve trumpeter black), even in the later 60s they went the same story with the Verve DJ issues with yellow label, then usual in black. Popular series (4000 and 2000 had three label versions – yellow/orange, blue and black). I’ve never encountered copies with black Verve labels of some early rare titles, for example Toni Harper Sings MGV-2001, which definitely was issued in 1956 (Billboard helps) and features orange/yellow or blue label. Yellow/orange label never appear on late 50’s MGV-4000 or MGV-2000 titles, for example Ella divided (I mean vol.1 or vol. 2) songbooks never issued that way, only with black labels. Yellow/orange label issues I have feature laminated sleeve, which was used on Clef/Norgan issues in the middle 50s, and faded away in the later 50s to return in early 60s. The same story with Ella and Louis record, the yellow/orange label issue feature a laminated sleeve, black label issue has a non-laminated sleeve. Most interesting is that the Ella and Louis yellow/orange label issue features the cover design as the early Clef and Norgan were issued – the back of the cover is glued over the front (like for example Prestige covers were made), but the black label Ella and Louis features a usual for late 50s cover design – a photo is glued on front. Both are Orange Yellow label Deep Groove pressings. Copy 1 is machine stamped matrix, laminated cover. Obviously copy 2 is a later, but still early pressing. Thankfully for me, copy 1 is MINT, and copy 2 is VG+. Easy choice regarding which to sell off…. As always this site is a wonderful resource. thanks a lot for sharing! mint copy of that record is not so easy to find by the way..
do you have an original inner sleeve on these? i’ve checked my black label copy – it has a Verve inner sleeve marketing some late 50s even maybe early 60s issues..
I’ve replaced the original inner sleeve on my orange/yellow label copy, but as I remember the inner sleeve was a plain one..
are you a seller or a buyer of that copy currently on ebay? i was watching that one and it kinda messed me up, since it has these rare labels (variation on yellow/orange ones), machine stamped matrix and yet a non-laminated cover.. This is the label I am refering to. Orange background with Black T.
It does not seem to be a “continuous series”, rather a one-off anomaly. Happens a lot with some labels. About that orange with black “T”, never seen that one before! 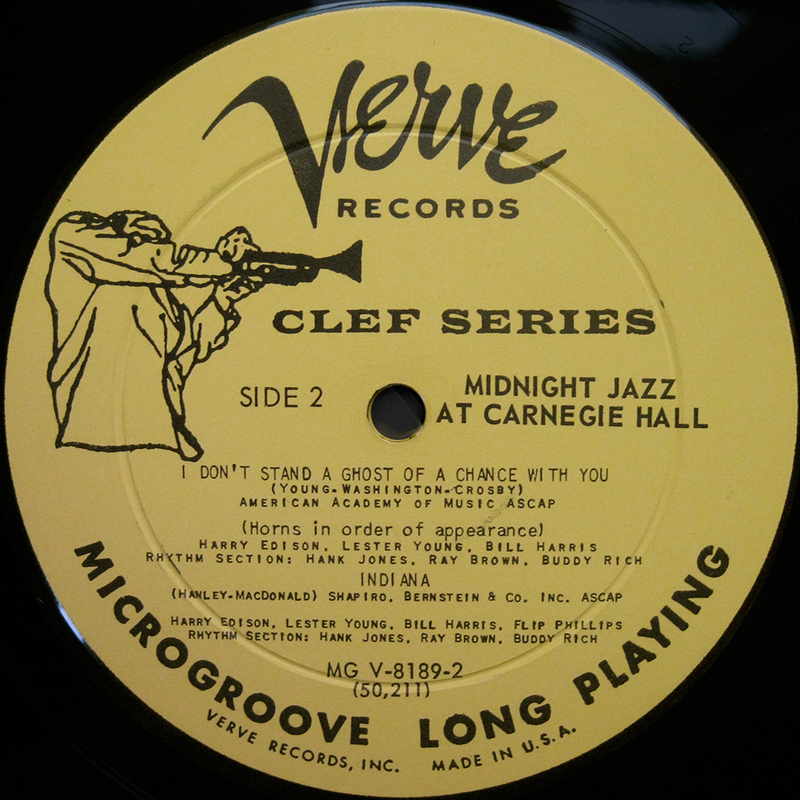 By the way, were there any DJ / Promo issues of Clef/Norgran/Verve before it was sold to MGM? 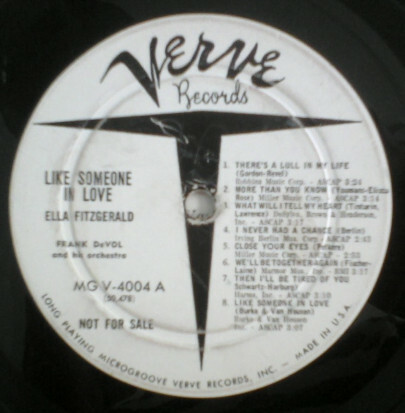 I remember only an Ella recording, Like Someone In Love, which had a special cover with a letter from Norman Granz himself and a b&w label. Just picked up Bill Evans Trio “Trio 65 v/v6-8613. Seems a mono release with non sterio black label from i oresume 1965. Also Has Van Gelder stamp. Any comments on Van Gelder produced and mastered Verve recordings? I’ve got a question about the yellow vs. black Norgran labels. There seems to be some consensus among collectors that the yellow labels are earlier, but none of the guides I’ve seen define that. In fact it looks like the labels were often used simultaneously. Any thoughts on this?. And specifically I’m thinking of Ellis In Wonderland. I’ve seen both black and yellow labels on this one. Yellow labels are earlier – that’s clear because some later Norgan titled never issued with yellow labels. What’s more – yellow label covers feature a laminated sleeve and the early cover scheme, black label issues usually feature a non-laminated sleeve and sometimes photo is in another color filter. Regarding Herb Ellis – In Wonderland. This is a late Norgran issue (1081), so there’s no difference in the cover – all Norgan issued feature a non-laminated sleeve with an yellow photo. I guess the black Norgan label Herb Ellis may be even rarer, than yellow label, and maybe was pressed at the same (almost same) time. 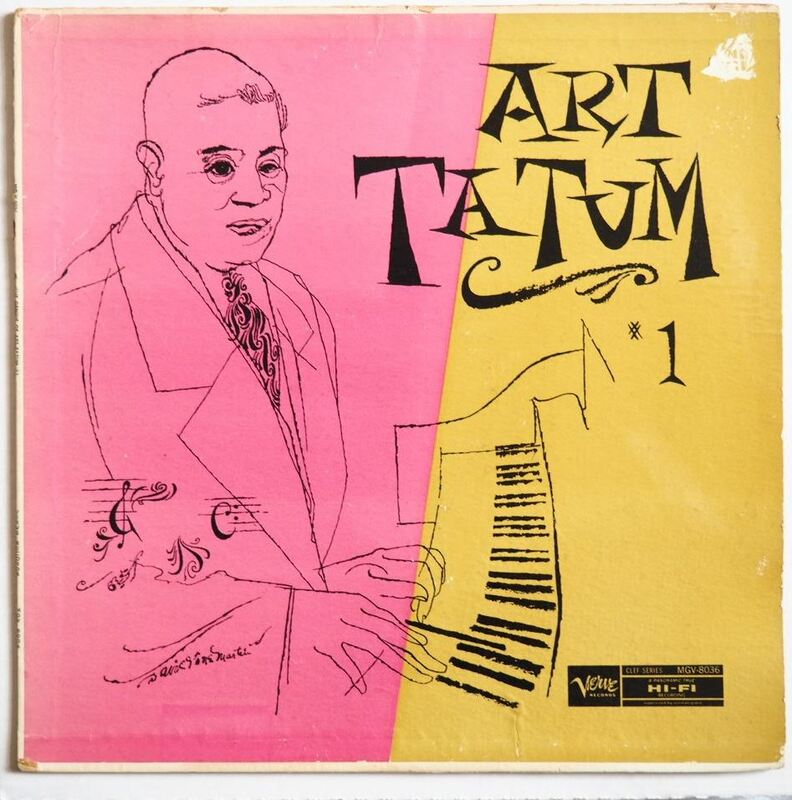 Suggestion: How about having similar coverage of the American Recording Society jazz catalog. Most of the issues came from Norman Granz, although he was not affiliated in anyway with ARS. Rudy Van Gelder mastered most of the tapes provided by Granz. I learned this in talking with Van Gelder himself. Apparently Abbey pressed the ARS records. They look good and sound good, and contain a lot of interesting recordings. The early, lower-numbered albums appear regularly on E-bay, but not so with the upper end of the catalog numbers, some of which I have never seen. I have most of the catalog but am missing several of the highest numbers. I know that Norman Granz recording aren’t quite popular among jazz collectors, but personally I think there are quite a few records one should own. 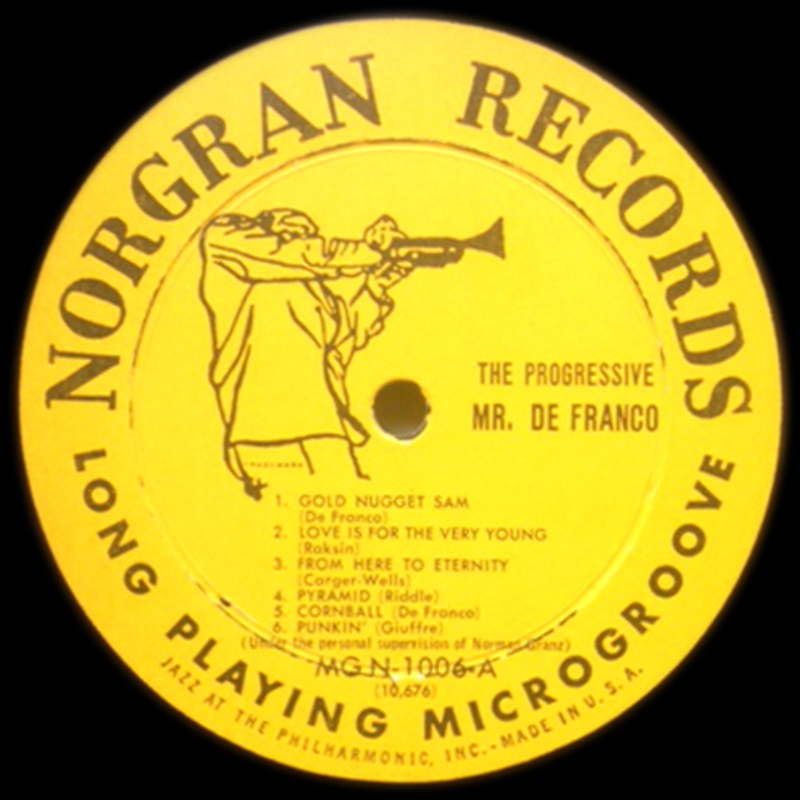 Norgran and Clef label designs vary in the size of the trumpeter – there is a large and a small trumpeter (similar to Emarcy designs). The design with the large trumpeter is definitely the older one. To distinguis the large one from a small one there is a word TRADEMARK under the trumpeter logo, which can easily be seen under a large logo, but appears like little circles under the small logo. 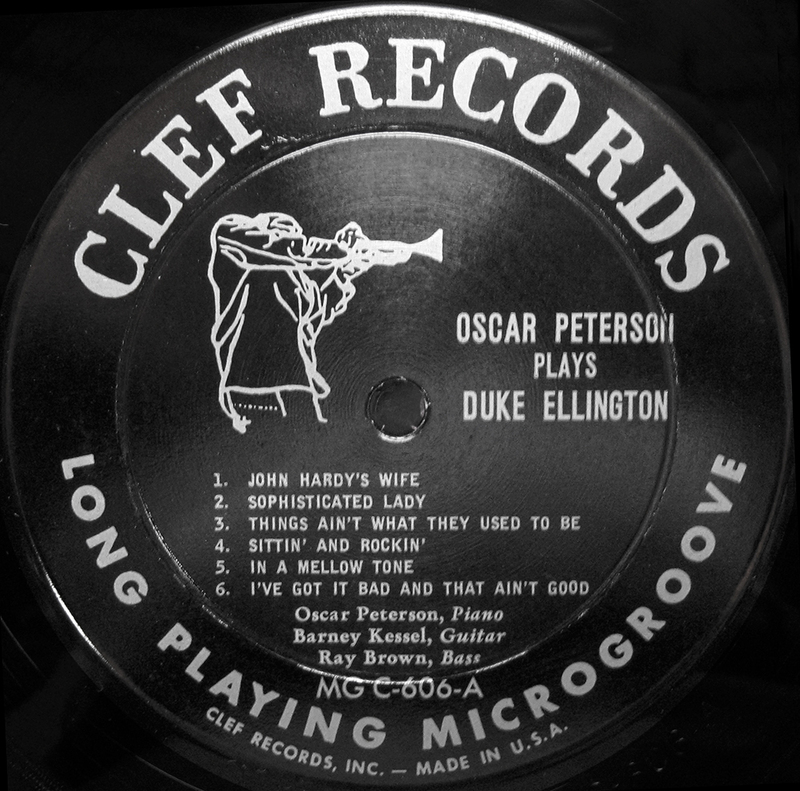 What’s important about this is that the large trumpeter label design was pressed on very heavy shellac and usually features the loud hissing sound on modern sound systems, which really can interfere with the music. Later small trumpeter design was pressed on still heavy, but lighter vinyl and one can find a pressing without above mentioned hissing sound much easier. Alexander, some time ago already that we met at the Bielorusskaya Voksal café. A pleasure to browse through your wonderful website. Re the size of the trumpeter on the Granz labels, do you notice the size difference on 25 and 30 cm albums, or only on 30 cm albums? I never noticed any difference. Do you have a specific album in mind? Rudolf, very glad to hear from you! As I know, all 10-inch Clef and Norgran albums were issued with the large trumpeter logo on shellac, but 12-inch ones do vary. I’ve noticed that vinyl appears in around Clef 650s, but I’m not sure..unfortunately I don’t own any of the first 30 Norgrans, but I think the situation is quite the same with them. I’m still not sure if there were any reissues on the same label (I mean if some records from Clef 600-650 were issued on shellac and later on vinyl-shellac mix). Thanks for the illustrations. I must admit that I never paid attention to this manifest difference. 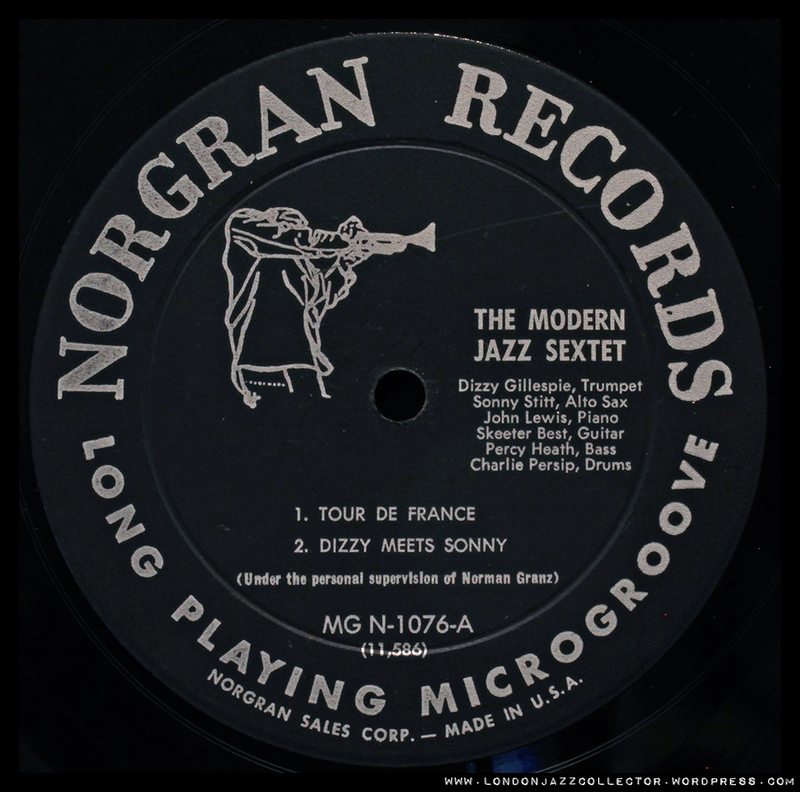 As you rightly mention, there is the mention “Jazz at the Philhormonic” which becomes later Clef Records or Norgran Records Inc. Another difference is the black: early pressings were shiny, later ones mat. May we assume that the change from big trumpeter into small coincided with JATP < Clef and shiny < to mat? I have had certain catalogue items in both versions: for me the distinctive difference was the shiny versus mat question and I have always, instinctively, favoured the shiny ones. I will pull out a few Norgrans (and Clefs) to see if our theory is right. You’re certainly right about this shiny/mat thing! One more coincidence I’ve noticed while looking through Clefs – there’s clearly a difference in cover designs and I suppose the change is made at the same time that this shiny/mat shellac/vinyl change happens. And later they started doing quite the opposite – photo is glued at the front and the text is just printed on cardboard at the back, what remained to be the design for the next many years on Clef, Norgran and Verve till the early 60s (with some rare exclusions like gatefold albums). I have not had the time to pull out a few Clefs. What you say about the manufacturing process of the sleeves is absolutely right. Also note the “HI FI RECORDING” sticker on the early HAMP qrt. I will revert to you later. -MG-N 1000. This Getz album sold very well. Thus my second pressing copy has a label mentioning Norgran Sales Corp. – small trumpeter and trade mark in very small characters. -MG-N 1001 Webster. Mine has JATP, big trumpeter and, of course, trademark. Now for the few Clefs remaining on my shelves. -MG-C 610. Bud Powell. JATP, big trumpeter, trademark. Shiny black. -MG-C 646. Bird. Clef records. Small trumpeter, trademark. Shiny black. -MG-C 732 Brookmeyer (re-issue of Clef 644): Clef Records, small trumpeter, trademark, mat black. So I learnt that “trade mark” on all issues featuring the trumpeter logo; shiny labels may have small trumpeter logo. The vinyl looks similar whether big or small trumpeter. There may be different weights. I did not check that. This unflexible shellack is common for the 25 cm issues. I’ve been digging more and unfortunately it’s much more complicated as I thought at first. 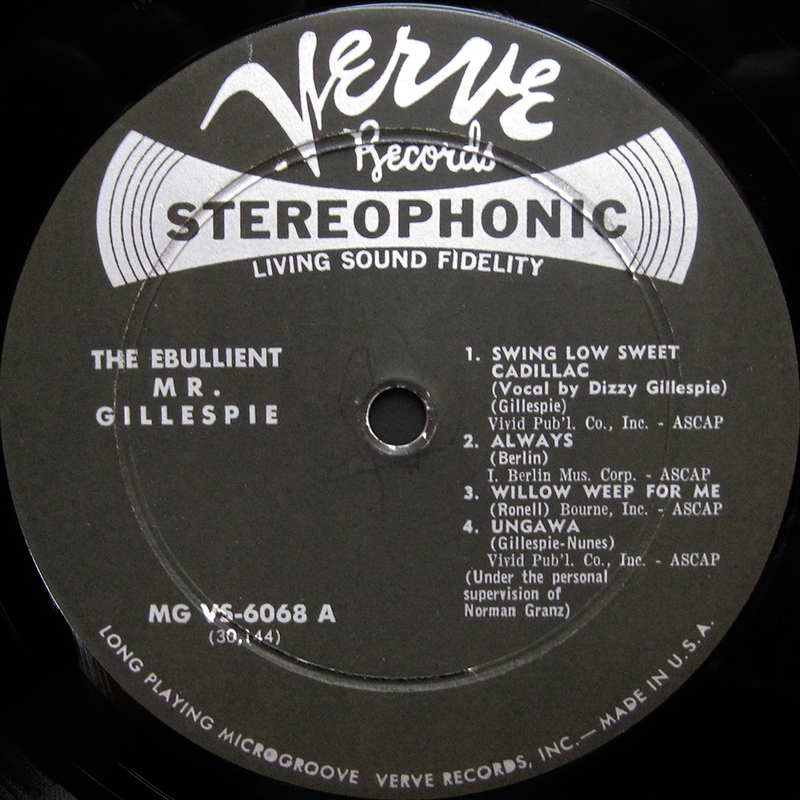 – large trumpeter changed to small around MGC 637 (Flip Phillips Quintet still had the large trumpeter label). 743- Metronome 1956 – mat labels, rest same as above. Norgran 1071 Pres – yellow small trumpeter label, TM, Norgran Sales Corp.
Norgran 1086 Buddy Rich – mat black labels, rest as # 1071. So the bigger trumpet logo labels, first pressings in the lower 600 series. Granz switched to uniform mat black labels for Clef and Norgran at the end of their life cycle, just before merging everything into the composite Verve label. I am glad you raised the subject. It was a nice occasion to deepen our knowledge. Hello, I have a question about a label. I bought a record at the local record store of Stan Getz (Jazz Samba) in stereo. 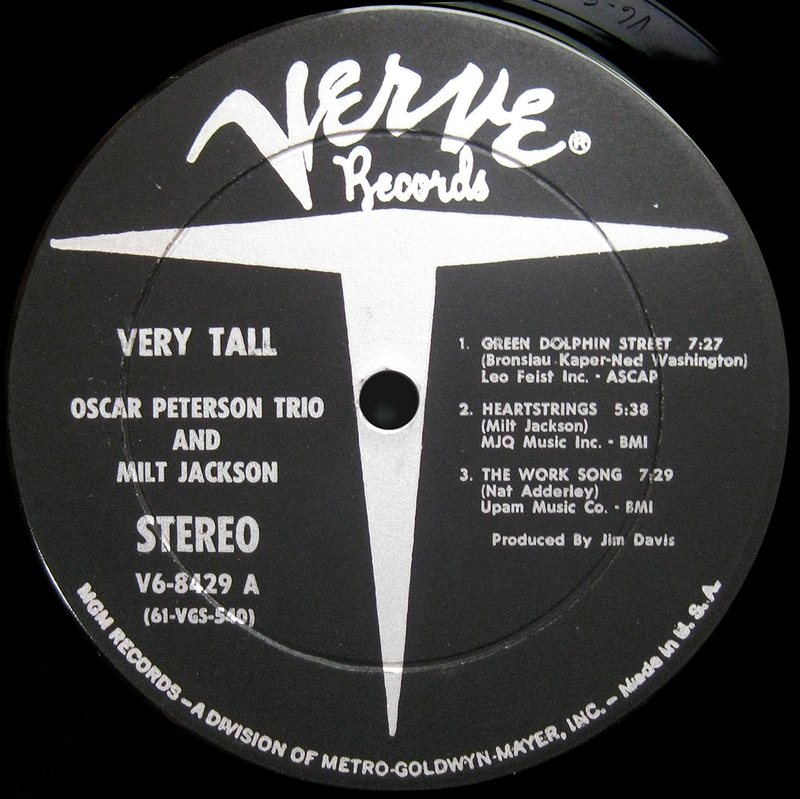 Although the record came out in 1962, the label is identical to the pre-1960 stereo label. Adding to the intrigue is the fact that the record was made in Canada. Any ideas or input about the label? I’m sure time travel can safely be ruled out. Canada often used old label designs for a few years after the US transitioned to a new label design. Common for many labels, Capitol, Columbia, etc. Thanks Aaron! I figured the fact that it being made in Canada had something to do with it. Hello, where do red Vervel labels with a yellow T come in? I just picked up a copy of Anita O’Day Verve-‎MG V-2000 from 1956 which has red/yellow instead of black/silver label. Not seen the red/yellow T label before, but as far as I can tell from the Verve discography, the label is found on recordings released around 1955/6, onwards – the Verve Popular 2000 series. I’ve put a picture in at 2B above. If anyone can add any more info, I’m glad to be corrected. I have three question regarding what is commonly referred to as the Norman Granz’ Jam Session series. 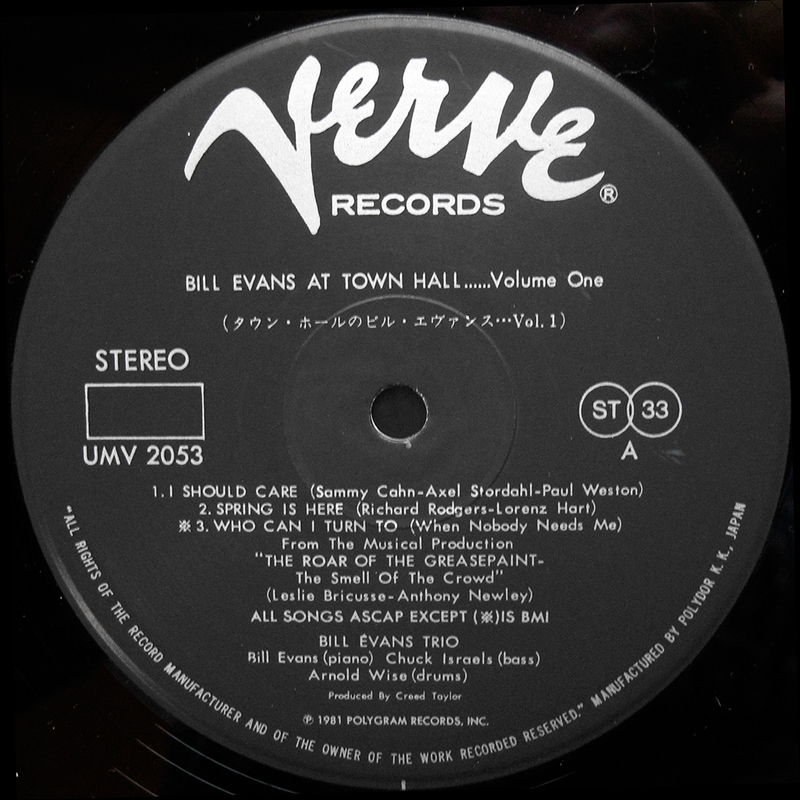 Regarding the original 12″-LP edition, can you confirm that it went (i) Mercury; (ii) Cleff; (iii) Verve trumpet; and (iv) Verve – T. Second question, did all of the series come out in a 7″ edition? And lastly, I’ve heard rumor that there was a 10″ of the Jam Sessions, like the JATP but I’ve never seen a listing for one. Recently I have purchased some Verve German pressings sold as first pressings. Any info about the year of reléase in the label or outer jacket. For instance, Jimmy Smith “Who’s afraid of Virginia Wolf?” title, V 6-8583 Stereo recording. Does anyone know something about the year of reléase of these recordings? Deutsche Grammophon often stamped the original publishing date in the deadwax on pre-1970 records. Thanks Aaron. But any date is stamped there. Only: Made in Germany – V6=8583=2 A , and this other: M6 OK F1. I don’t know what means. first time post here – great site! It’s definetely a pressing and lacquer cut by Deutsche Grammophon Gesellschaft. M6 is a code for the date when the lacquer was cut, in this case December 1966. “The letter symbolises the month (A = January, B = February, C = March, D = April, E = May, F = June, G = July, H = August, J = September, K = October, L = November, M = December) and the figures the year of the mastering, e.g. 3 = 1953 or 1963, 4 = 1954 or 1964, 9 = 1959 or 1969. V6=8583=2 means it’s the second lacquer cut from the tape. 1 should be the sequential mother number. Thanks for posting, I never about the date coding on DGG records! Hello, I have been a lurker on your site for awhile. I have a Verve specific question. I have 2 copies of Getz Meets Mulligan in Hi-Fi; one with a deep groove trumpeter logo (shown above as used in 1958), and a copy with the usual “T” label (shown above as used from 1956-1960). Which is the earlier pressing ? Thanks ! 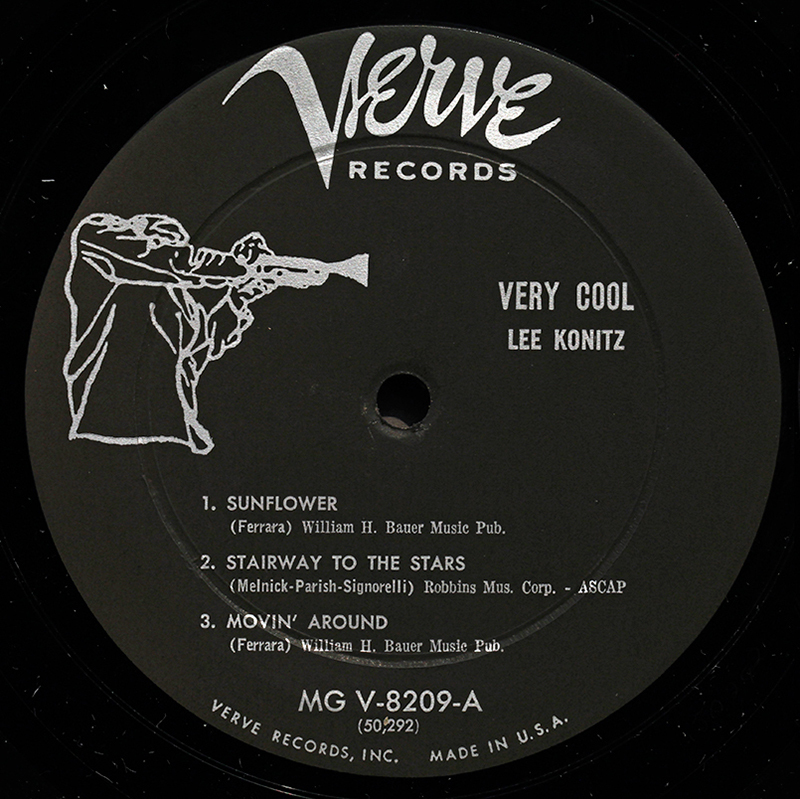 – 2 (Clef), 4 (Verve Trumpeter), 7 (Verve Stereo) – all printed by Bert-Co Press of Los Angeles, CA. 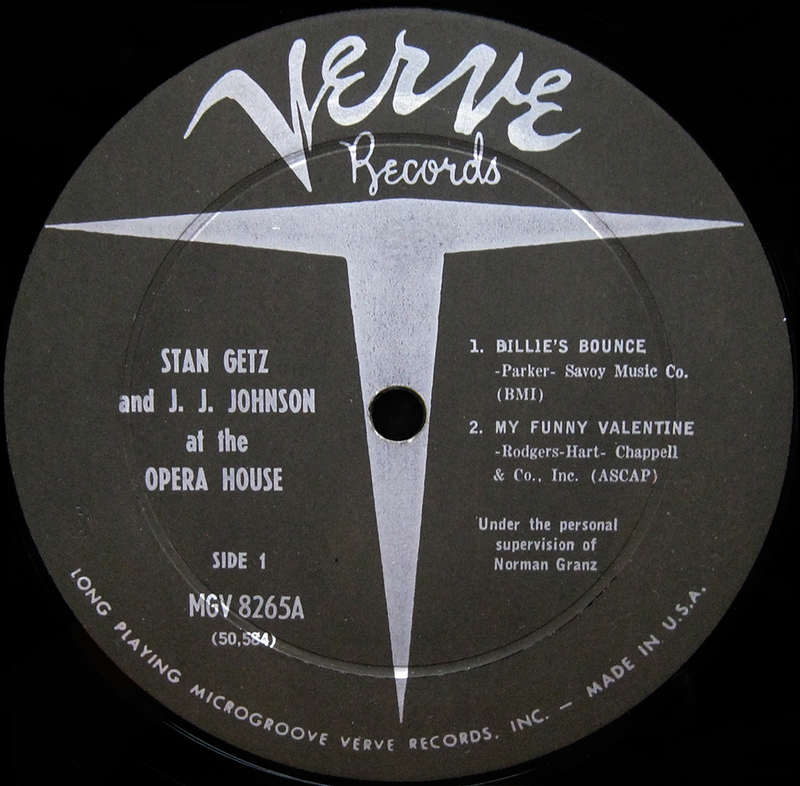 – 6 (Verve T / MGM mono) – with 1.25″ deep groove, pressed by MGM’s own Bloomfield, NJ plant, with label fonts from Pace Press, Inc. of New York City. – 8 (Verve T / MGM stereo) – pressed by H.V. Waddell Co., Burbank, CA, with a collection of Ludlow fonts in the Tempo family that were characteristic of pressings from that plant. 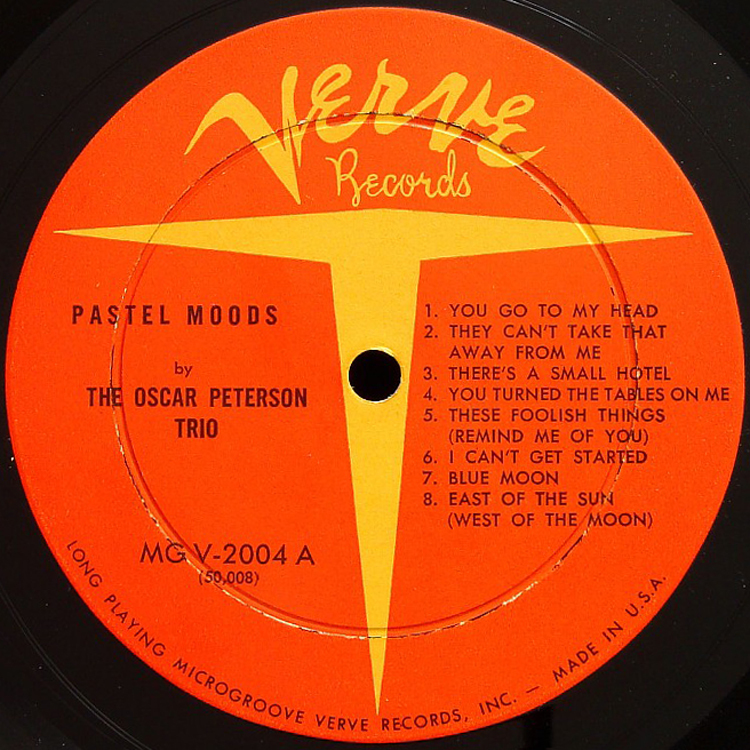 Waddell pressed 45’s for MGM / Verve through 1966, and LP’s right up to the end of the line for MGM itself as a record label in 1976, when by-then parent PolyGram transferred the remaining MGM artists to Polydor. It should also be noted that up to MGM’s acquisition of Verve, the bulk of lacquer mastering for Verve was handled by Radio Recorders in Hollywood. I.I.N.M., after Creed Taylor assumed A&R duties for Verve upon MGM’s takeover, was one of the earliest associations between him and the legendary Rudy Van Gelder – which would continue well into Taylor’s founding of CTI Records (first as an A&M subsidiary, then as an indie). Are samples of these fonts available in the public domain I wonder? Could make an interesting “Advanced class in label recognition”.